The Norwegian Nobel Committee “has decided to award the Nobel Peace Prize for 2017 to the International Campaign to Abolish Nuclear Weapons (ICAN). 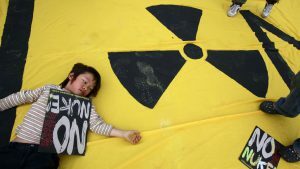 The organization is receiving the award for its work to draw attention to the catastrophic humanitarian consequences of any use of nuclear weapons and for its ground-breaking efforts to achieve a treaty-based prohibition of such weapons. … Five of the states that currently have nuclear weapons – the USA, Russia, the United Kingdom, France and China — have already committed to this objective through their accession to the Treaty on the Non-Proliferation of Nuclear Weapons of 1970.” See text and video. Also see IPA news release from last month: “More Than 40 Nations Sign Nuclear Ban Treaty in First Hour.